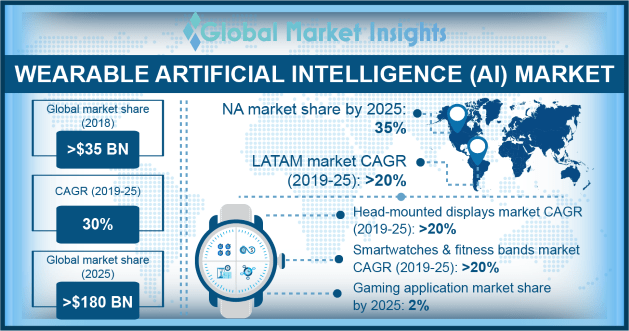 Wearable Artificial Intelligence (AI) Market size is set to exceed USD 180 billion with over 1 billion units sold by 2025; according to a new research report by Global Market Insights, Inc. The explosive growth of smartwatches has been the primary factor propelling the wearable AI market. Continuous improvements in the design and functionality along with its availability at lower price increased its adoption among consumers. Specifically, the introduction of LTE connectivity feature in smartwatches has provided customers with an alternative to bulky smartphones. Moreover, the convenience provided by smartwatches is promoting its usage among consumers across the globe. The technological advancement in miniaturized electronics and mobile access to computational power is propelling the growth of the wearable AI market. The advances led to the development of various advanced wearable sensory hardware offering minimally intrusive health monitoring platform for individual health service. This has provided consumers with a means to improve early stage detection of diseases along with reducing the overall costs associated with more intrusive standard diagnostic services. The increasing data security concern regarding smart wearable devices is hindering the growth of the wearable artificial intelligence market as most of the smart wearable devices lack basic security mechanism. Moreover, high production costs and limited battery concerns are restraining its adoption among consumers. The earwear market is anticipated to attain a growth rate of over 43% during the forecast period. The wearable artificial intelligence (AI) market is driven by the increasing integration of AI-based voice assistants, such as Siri and Alexa, by large smartphone manufacturers into their product offerings. The increasing popularity of AI-based voice assistants has led to the rise of companies, such as Bragi, that launched their own smart earwear devices leveraging on AI-based voice assistants to help users conduct various activities through voice commands. Most of the earwears are equipped with biosensors, that track user’s heartbeats, to customize various user experiences. For instance, it personalizes soundtracks for the users based on their heart rate. Another factor that has acted as a catalyst in the adoption of AI-based earwear devices is the elimination of 3.5 mm jack from smartphones and increasing integration of Bluetooth technology as an alternative to the traditional wired technology. The gaming market is projected to register a CAGR of over 35% during the forecast time period. This is attributed to the technological advancements in the AR/VR-based gaming software and hardware consoles. The integration of advanced video and audio graphics in the AR/VR-based immersive environments is rapidly gaining popularity in the gaming industry. The smart wearable device manufacturers present in the landscape are incorporating various next-generation technologies into their product offerings, such as interactive graphics and 3D effects, to offer more realistic experience to the gamers. The high cost associated with gaming components and the lack of standout content are hindering the use of wearable AI devices in the gaming landscape. North America held over 30% share in the wearable AI market due to the high per capita income of consumers in the region. The presence of major consumer electronics companies, such as Apple and Oculus, provided consumers with access to products at a lower price. Furthermore, the high adoption of smart wearables among consumers between the age group of 16 and 34 (millennials) also foster the wearable artificial intelligence market growth. The players in the wearable AI market are forming partnerships with other companies present in the market to gain an edge over their competitors. For instance, in April 2018, Oculus collaborated with Xiaomi to launch a new standalone head mounted display product specifically designed for the China market. This partnership will allow Oculus to leverage on the distribution network of Xiaomi in the Greater China region and better compete with various smaller regional smart wearable device manufacturers in the region. The startups are also adopting inorganic growth strategies by collaborating with prominent organizations from adjacent industries. For instance, in December 2018, Huami signed an agreement with Timex Group to jointly develop a new smartwatch. According to the agreement, Huami will combine its AI technology and app design expertise with Timex Group’s manufacturing capabilities to build a new generation of smartwatches. Some of the companies operating in the wearable AI market are Apple, Facebook, Garmin, Xiaomi, Bragi, ANTVR, Huami, Jabra, Microsoft, HTC, Huawei, Fossil, Fitbit, Samsung, and Google.